Pics of our new home! 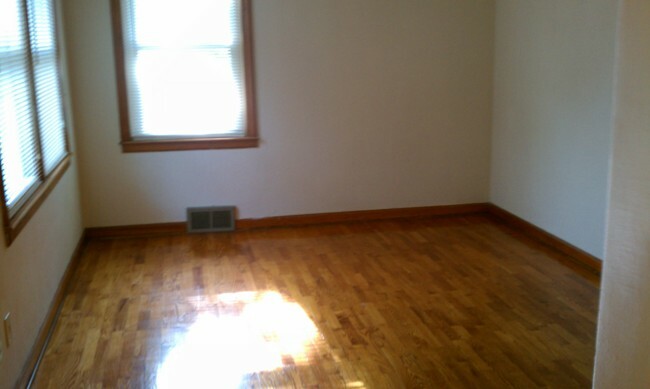 I’m so excited because we’ve been praying for awhile now for a new rental home ~ and we found one! I LOVE it and am SO thankful to God for it. I am still getting my new office ready, and we still have to buy some new furniture for our dining room and front entry room, but we are settling in. 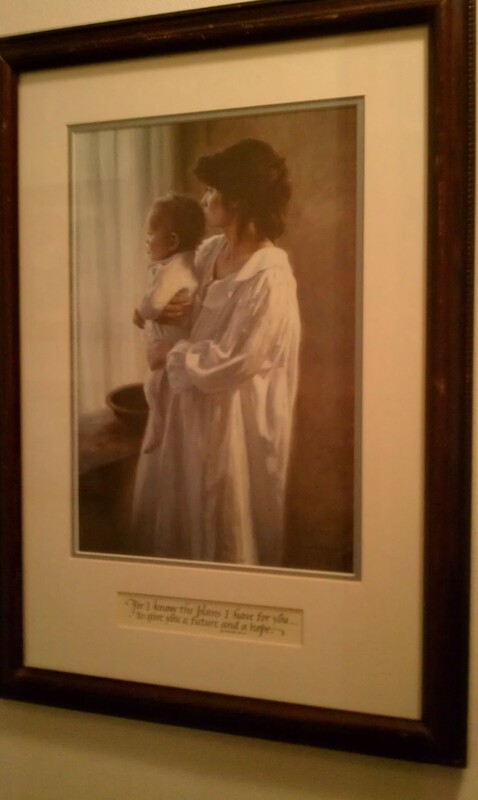 I wanted to show you how God has so graciously BLESSED us. 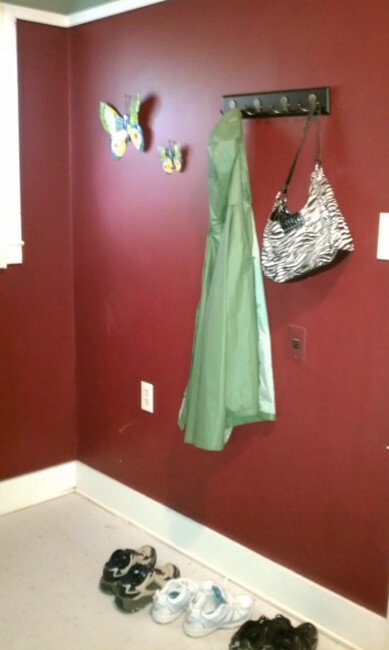 As you walk through the back door, there’s a utility room for coats and muddy or snowy shoes or boots. The bright butterfly decorations, which Ray bought as a souvenir for me on one of his Haiti trips, brightens the walls. This room also has a little sink and cabinet for storage, where I’ve put Leah’s paint and drawing supplies and some of my office supplies on the shelves. 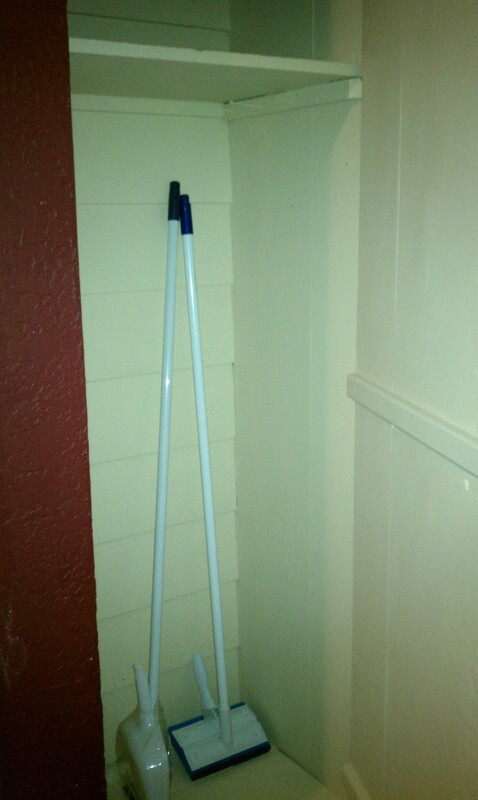 The utility room also has a little closet for storage of a broom, a mop, and cleaning supplies, which I put on the top shelf this week. 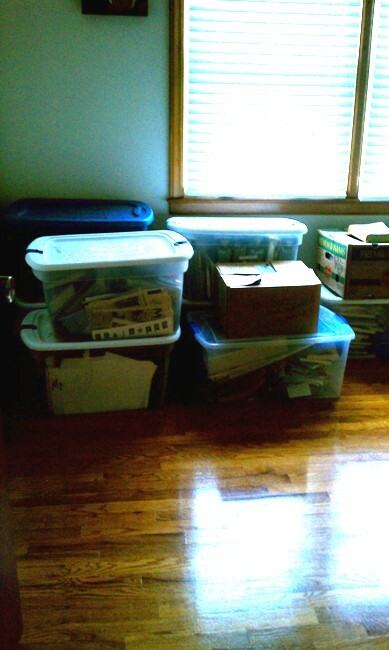 For a woman, storage like this is important! 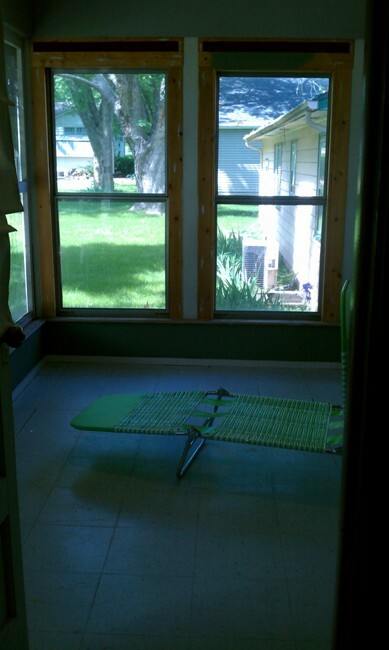 One reason I wanted this house so much was that it has a sunroom. I first saw these in Florida when I was stationed there as a flight attendant. They are common there. This one looks like the screened porches in the south, but has glass windows on the side. I immediately envisoned taking out the front window screens and replacing them with glass to let the sunlight stream in, retiling the floor, and adding fresh plants. 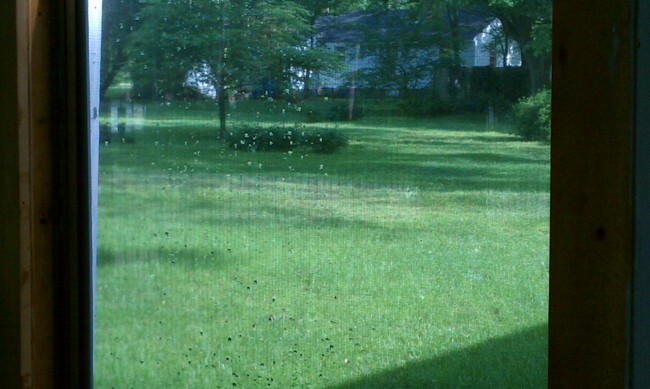 Here’s a view of the beautiful yard, where I watch the birds and squirrels. 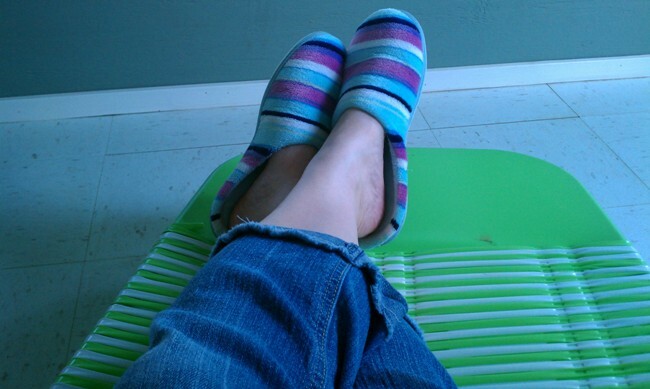 Here’s a pic of me with my feet up, in my slippers, relaxing in the sunroom. 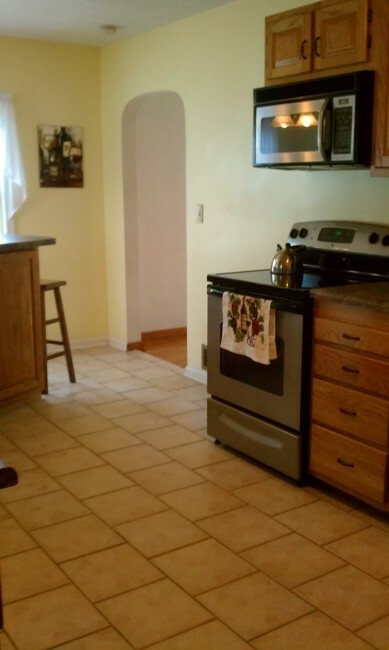 The kitchen is bright and cheery with yellow paint, stone tile floors, new cabinets, pretty green and black counter tops, and several windows for plenty of sunlight. One of the reasons I wanted this house was the beautiful Spanish arch doorways in the kitchen/dining room and front entry (living) room. I love the character and unique quality these arches add to the home. The kitchen also has a breakfast bar, which I’ve always wanted for our kids! (We still have one at home.) 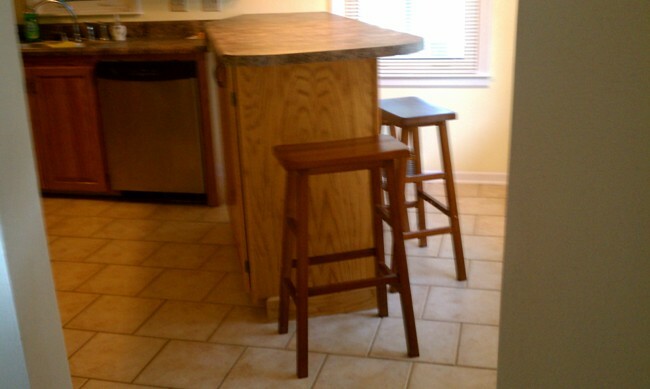 I found these cute, dark wood, saddle seat bar stools for the breakfast bar. I’m in love with the Spanish arch doors and this painting of the red wine and the wine glasses blesses my soul. 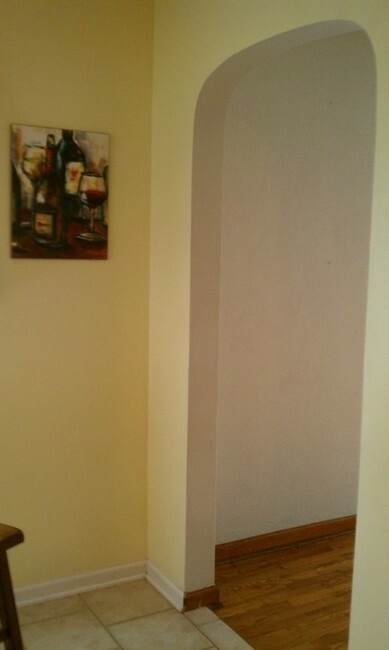 I’m planning to decorate the kitchen in an Italian theme with paintings, decorative pepper bottles, etc. This is our dining room. 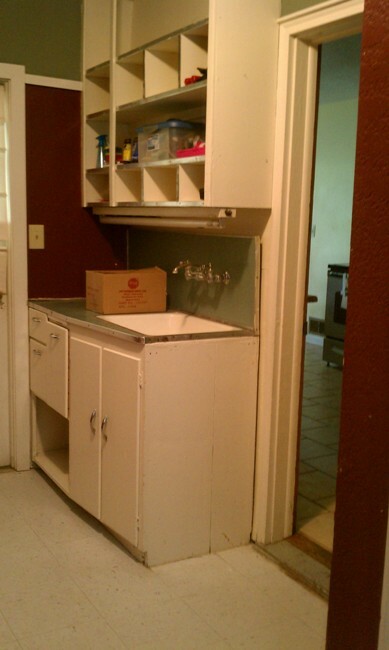 I’m planning to buy a modern, new dinette and some Italian painting art to decorate the walls asap. I love all the light in this room. 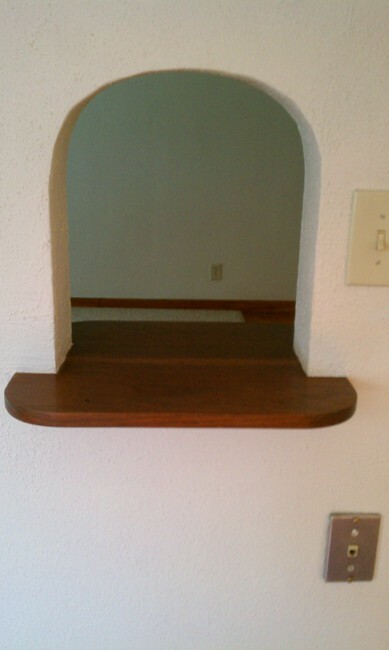 This little arch and the shelf in the dining room are another reason I wanted this house. It is so cute! Yes, I’m easily entertained. It was for a phone to sit on. I’m going to shop at Kohl’s or Target for a little deco. 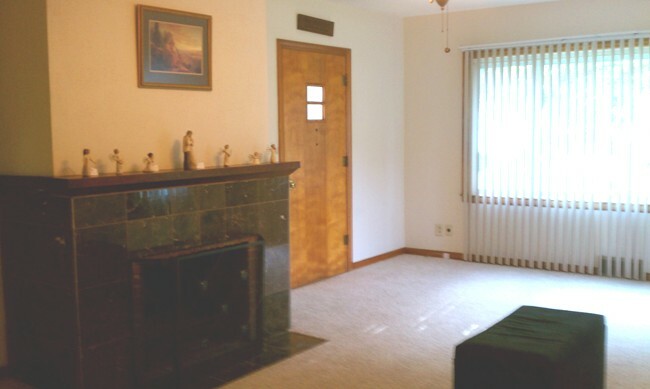 This is the front entry, or living, room. The big windows allow plenty of light into the room. 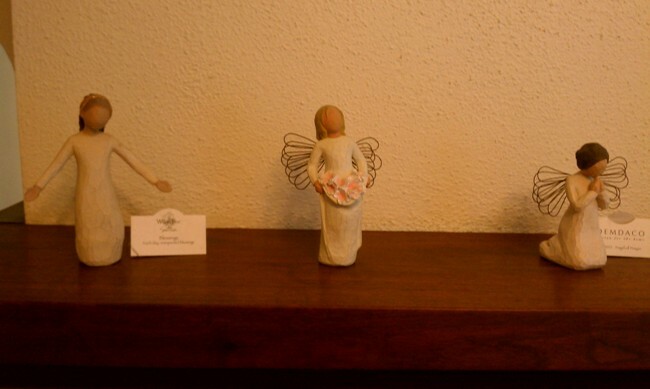 The fireplace doesn’t work, but its pretty mantle makes a perfect shelf for my Willow Tree angels. You can see from the picture that the walls aren’t your typical modern sheetrock. It’s a special material made in older homes. The angel on the left is called “Blessings: Each day unexpected blessings.” Amen! Look for those unexpected blessings in your life each day! 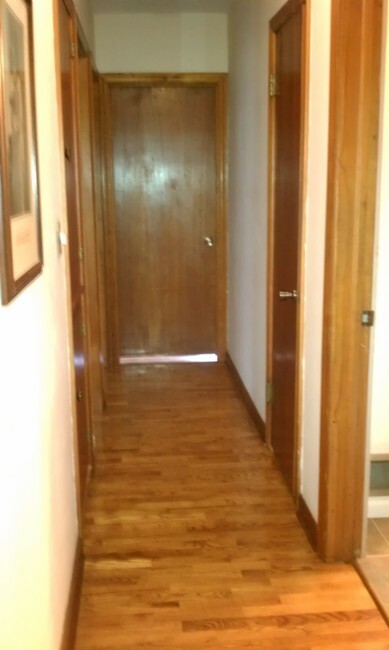 Here’s our upstairs hall. 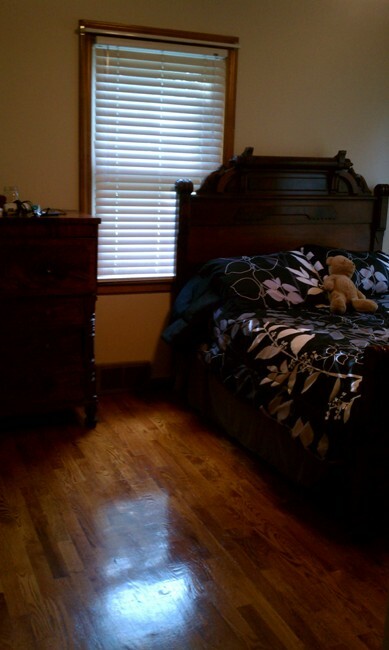 The upstairs mostly has the hardwood floors. I can only clean these with vinegar and water. I like the NIV version which says, “plans to prosper you.” And I also love the CEV version says, “I will bless you with a future filled with hope—a future of success, not of suffering.” God wants to bless you with success! Here’s the main bathroom. I just know you are dying to see this! haha. 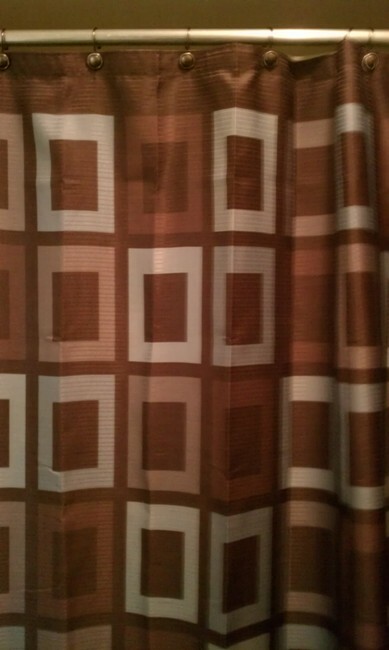 I bought a new shower curtain for the bathroom – chocolate brown and teal, squares- and a chocolate brown rug. Yes, anything chocolate, please! Here’s Leah’s desk and computer with her graphic art tablet. 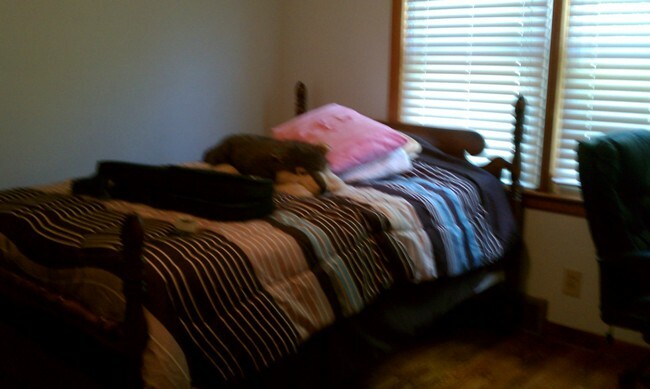 Here’s Leah’s bed. The room was painted a pale blue, so we found a comfy, new, chocolate brown and pale blue striped comforter for her new room. 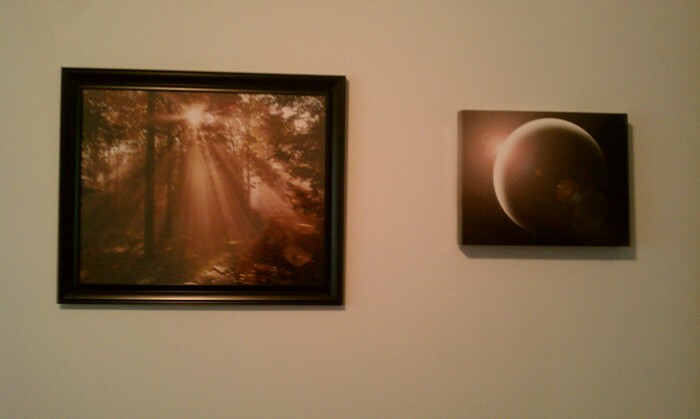 Leah saw a picture of trees with sunlight streaming through that she liked, so we bought that. I also hung up her picture that she drew with her graphic art tablet of the moon. We’re still hanging pics. 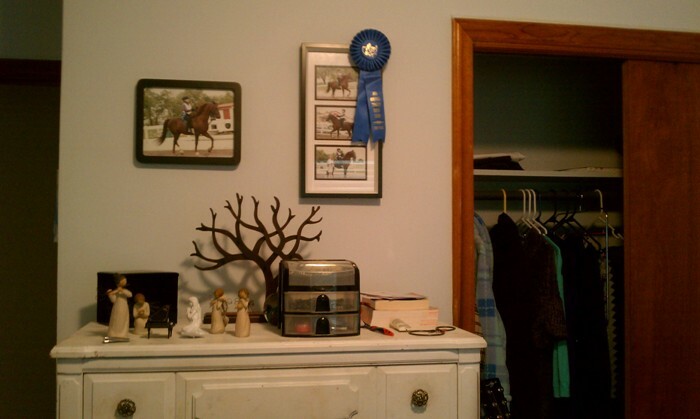 Above her dresser hang the pictures of Leah’s English riding horse show, where she won the blue ribbon first place. I was so proud of her that day! Here’s our bedroom. Our new comforter is a stark, black and white floral theme. 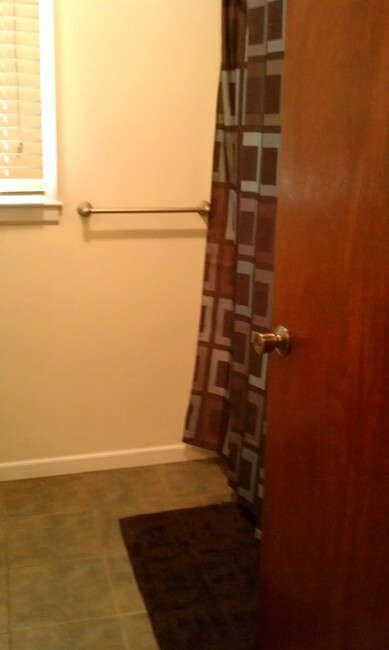 Curtains for each room is on the to-do list. 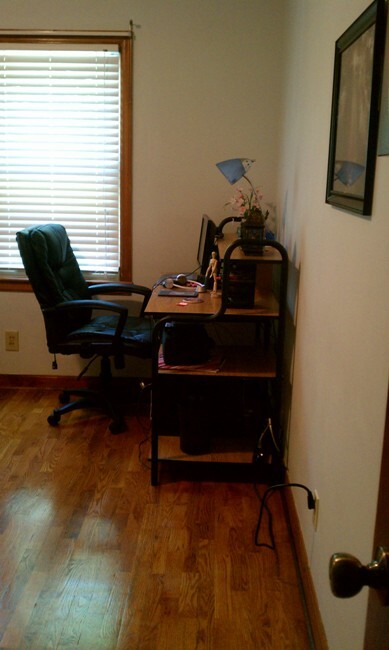 I’m still working on my office, but you can get a sneak peak at it here. This weekend I’ve been going through plastic tubs. 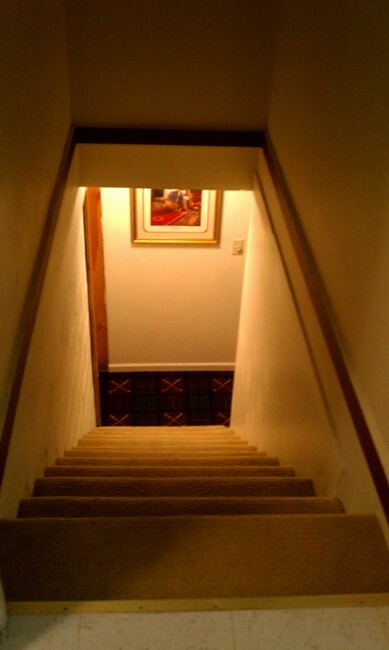 Here’s the stairs to the downstairs recreation room – a partially finished basement. The unfinished part of the basement is for our washer, dryer, and storage. When I first saw the recreation room, I thought it’d make a perfect man cave for Ray. 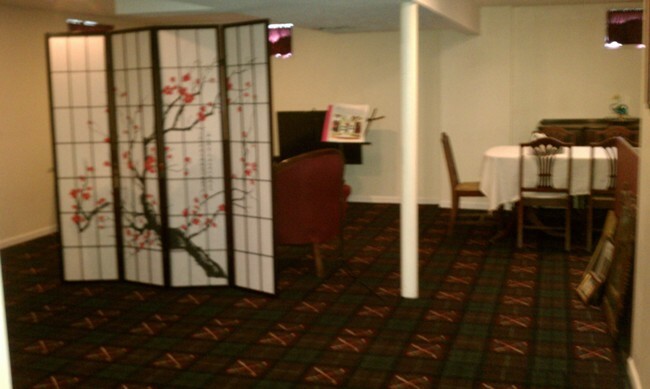 I used a pretty, cherry tree room divider to separate the “recreation” area from Ray’s office area. The recreation area is where our big screen t.v. is now, so he and Leah can enjoy watching Star Trek and other sci-fi movies. 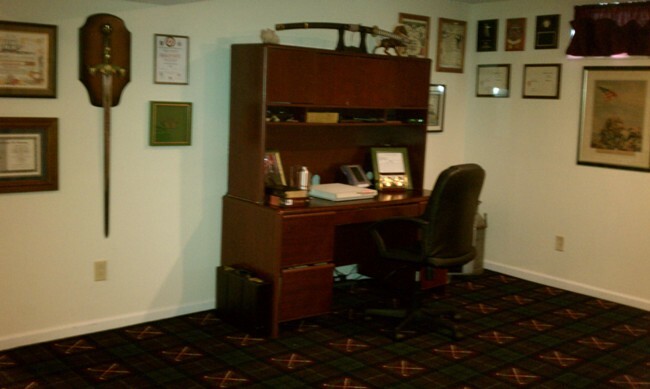 Here’s Ray’s office area of the recreation room – his desk, his swords, and many of his plaques for his accomplishments. 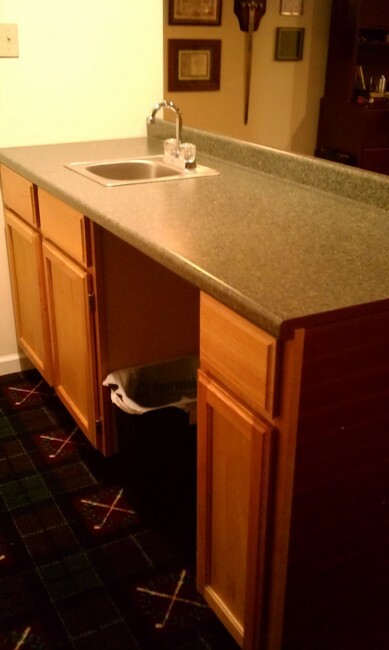 The rec room/ man cave also has a bar, for cold drinks. I think this is cool. 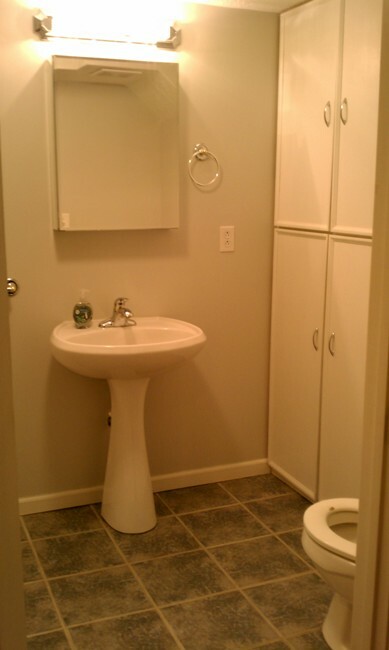 Here’s the downstairs bathroom.. Everything in the house has been completely remodeled. I really like the blue stone tile in this bathroom. 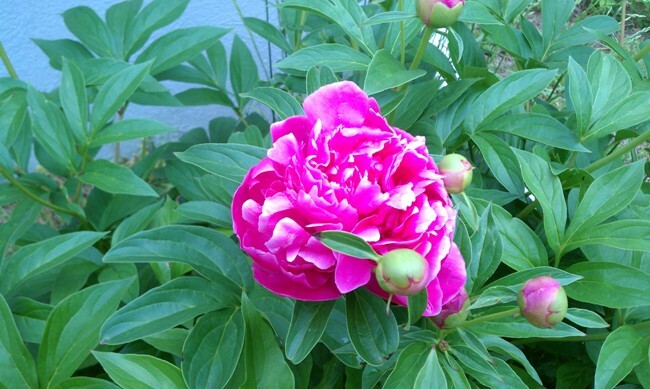 Outside we have several bushes of pink peonies. Beautiful! 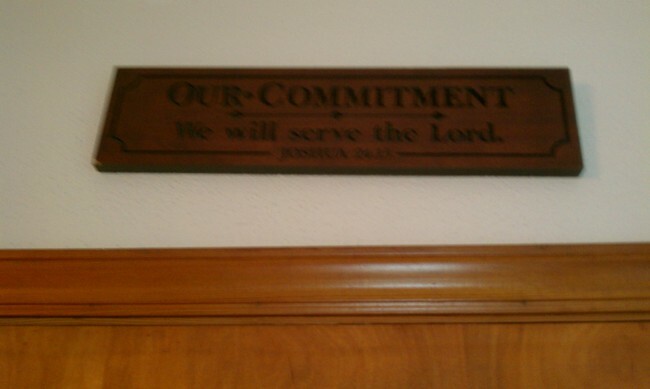 Over our front door we have this sign: Our commitment: We will serve the Lord. This is our new, beautiful home! I’m SUPER excited to be here, and just walk through the house smiling. It’s peaceful and beautiful here. We are SO grateful to God for this blessing! What do you think? Leave your comments below. Thank you, Susan! And it’s fun being here! Thanks, Beth, I’m so very grateful! Glad it’s catchy! 😀 God is awesome! Thank you, Amanda! 🙂 Me, too! Thanks, Bess! Yes, I AM very excited! 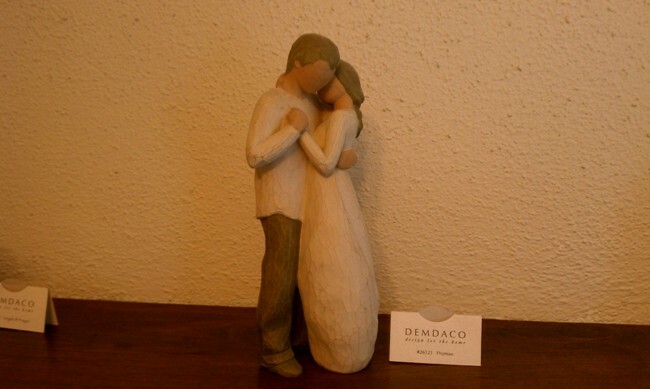 I receive those blessings and back at you-love you too! I loved this tour of your new home, Beth! How fun! I’m so happy for you Beth! I can “hear” the joy and gratefulness in your voice. It’s catchy! Congratulations, I’m so glad God has blessed you with a home that gives you such joy!